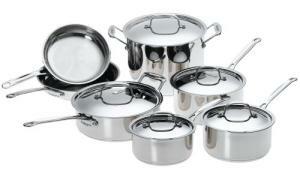 For a popular blend of looks and durability, it is hard to go wrong with stainless steel cookware. This set from Cuisinart is certainly built to last. Every component of these pans is manufactured from the metal. The pans and lids are made from 18/10 stainless, well known for its resistance to corrosion and long lasting appearance. In addition, there is a layer of aluminum encapsulated in the base to provide a superior surface against the cooktop for even heat distribution when cooking. While these pans do not carry the aluminum layer up the pan sides, with careful attention to heat control excellent results can be achieved. It's nice to see the all-steel lids accompanying this set. While the tempered glass style is elegant, the fragility is a bit of a distraction to serious cooking, and the venting necessary with them compromises a good seal when steaming food items. For those used to nonstick cookware, stainless steel takes a little getting used to. A lower heat setting is preferred, and a light coating of cooking oil when frying or braising works wonders. While this cookware is basically bulletproof, the high polish shows stains and scratches readily, so extra care will keep these shining for many years. Here's a smaller stainless steel cookware set by All-Clad, but it boasts a copper core for proper heat distribution.